Could an Apple TV SDK give us some clues about the rumoured iTV set? 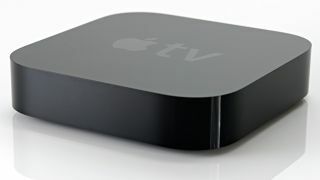 Apple may begin paving the way for the standalone 'iTV' by opening up the existing Apple TV set-top box to third-party app developers. Boy Genius Report reckons the company will announce an SDK for its hobby project at the WWDC conference in San Francisco, which kicks off on Monday. Naturally, that would bring an Apple TV App Store to sit alongside the iOS and Mac OS X offerings and open the little hockey puck up to more video on-demand, internet and gaming applications. One of the major criticisms to be levelled at the current-generation Apple TV set-top box is the lack of application depth. Currently, the paltry selection only features the likes of Netflix, iTunes, YouTube, NBA.TV and MLB.TV. A full App Store would certainly give owners of the £99 ($99) set-top box a little more to get excited about, beyond AirPlay and AirPlay Mirroring with iOS. Any announcement the company makes on Monday could also bring clues about Apple's plans to enter the flatscreen TV market. Stay tuned.